Gagaku music has a long history, traveling east along the Silk Road until it was introduced into Japan from China over 1,400 years ago. Gagaku incorporates in its theoretical structure both the Taoist theory of yin-yang and ideas from Mahayana Buddhism, and is said to represent the order and harmony of the universe. 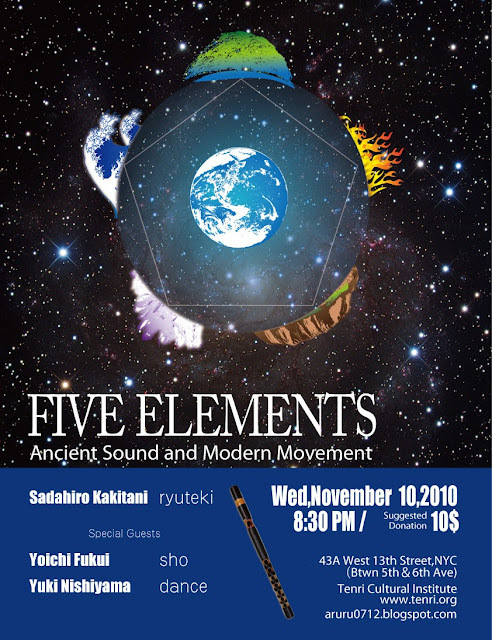 Sadahiro Kakitani, a Gagaku musician, will feature in this concert　the debut performance of his original composition FIVE ELEMENTS, inspired by the Chinese philosophies of yin-yang and the five elements of the cosmos, with modern dance interpretation by Yuki Nishiyama.